If you like it loud get some noise makers! These are the LOUDEST fireworks legally available in Canada. They give you a lot of bang for your fireworks dollar. At these prices you can afford to get a few of them and scatter them throughout your show. You can also use bangers to start the show to get everyone's attention. Sky rockets and noise shells must be partially buried. The fuse is on the side. Get a bucket of sand or make a hole in the ground. Do not hold these or any other firework in your hand while shooting. Luminous green tail, solid loud bang. Quality banger. Loud aerial detonation with red flash. Silver splitting butterfly effect with loud detonation. Rising vertical spray of crackling stars to loud bangs. Fires a screeching rocket into the air that finishes with a loud bang. Whistling rocket to air burst. 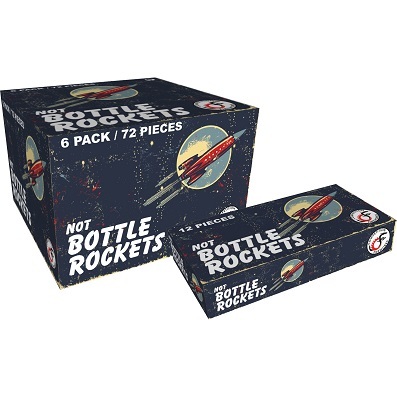 12 Pack of whistling rockets that end with a burst.